Claranet Ethernet First Mile (EFM) services provide a private, high-speed, managed internet circuit to connect your business locations. Offering guaranteed and dedicated bandwidth, backed by expertise, Claranet EFM offers an ethernet-like service at a lower price. Why choose Claranet for Ethernet First Mile? 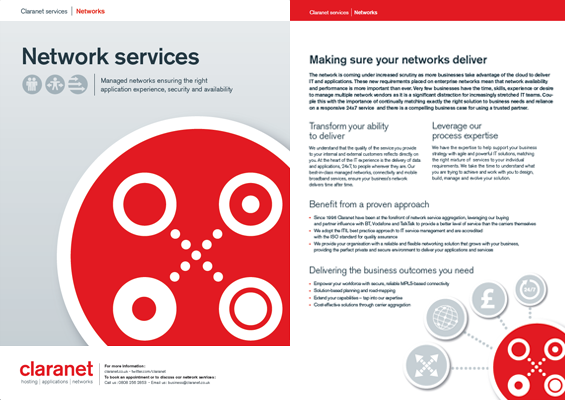 Our experts can advise you on which of our connectivity services is best suited to your business needs. Working with Claranet removes the burden of project managing and carrying out the installation of your Ethernet First Mile service yourself, saving you time. We take care of the ongoing 24x7 management and monitoring of your service including managing the router. However, you retain the control you need with access to around the clock UK support. How does Ethernet First Mile work? Ethernet First Mile is an ethernet Service provided over multiple bonded copper pairs (maximum eight). The bandwidth available is dependent on the distance from the local BT serving exchange (maximum 4.8km) and the number of spare copper pairs available to the premise. Ethernet First Mile offers connectivity between the customer site and Claranet offering bandwidths options up to 35Mbit/s. Similar to other Claranet ethernet products, the service is underpinned by service level agreements and supports Quality of Service.